I have been planning on cooking up some Oeufs en Cocotte for the blog for a little while now. It’s a dish that I love, perfect for a swish breakfast or even a light supper. 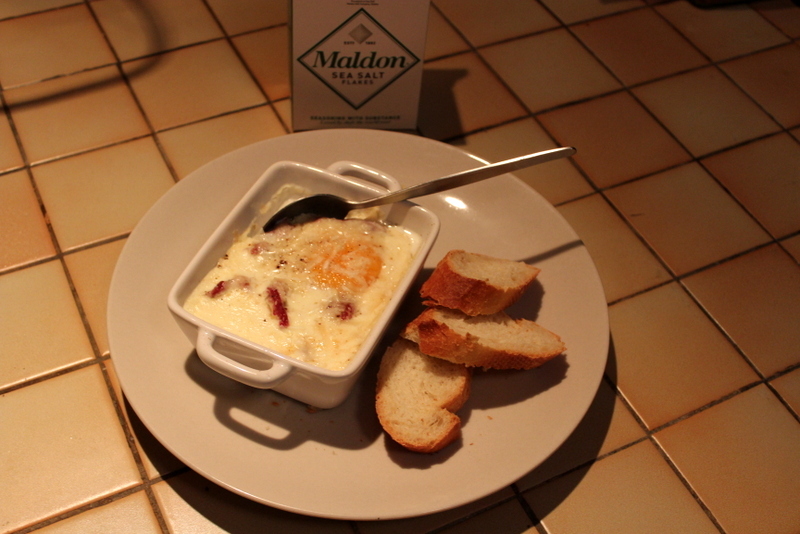 Gooey, oozy eggs, baked with some cream, eaten with a spoon and lots of lovely fresh bread. I wanted to create a truly Gascon version and so I decided to add gesiers de canard, not an ingredient readily available in the UK. So if you do want to follow this recipe but can’t get any gesiers, why not add some bits of bacon or parma ham instead. 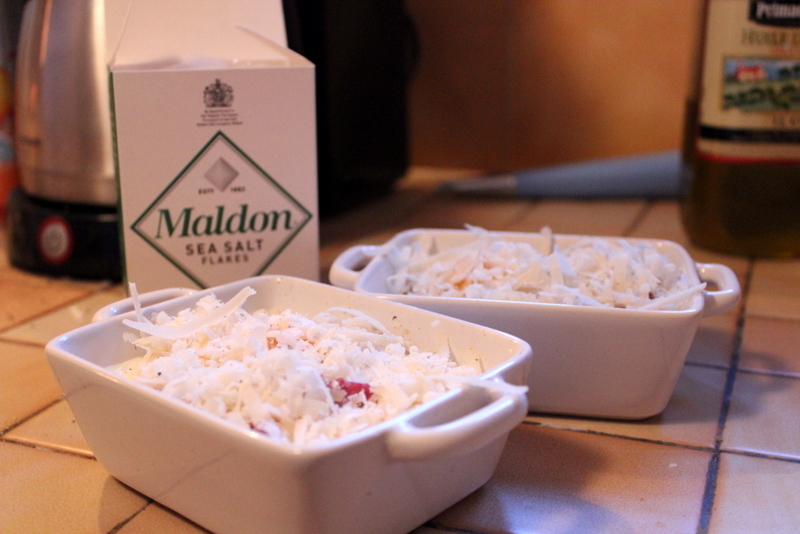 I was also recently sent a beautiful Maldon Salt Season box and asked to take part in their #Flavourofspring campaign and share some Spring inspired recipes. This dish fits as eggs are actually in season! Chickens do not just lay all year round happily, they prefer Spring, Summer and early Autumn. All my chicken owning friends have a plentiful supply right now so this dish should come at just the right time to use some up. And so, I settled on this dish as a #Flavourofspring, made all the better by a liberal sprinkling of Maldon Sea Salt and a healthy grind of ground Maldon Peppercorns. 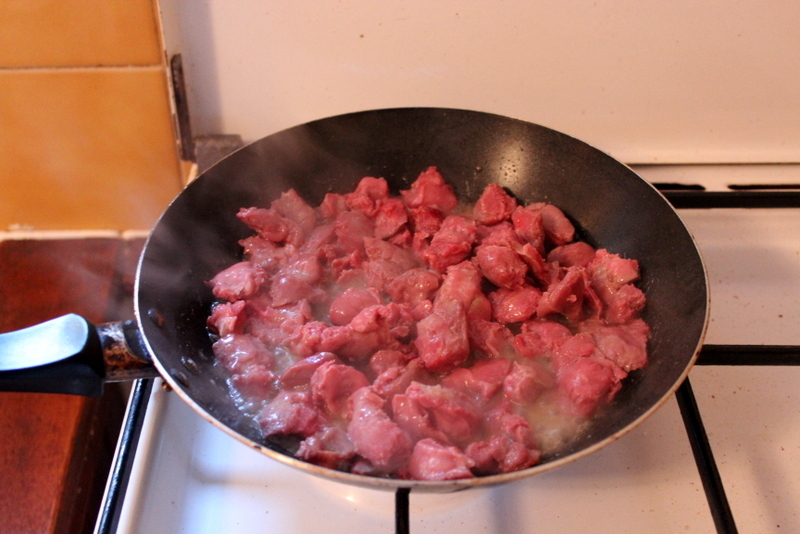 The Gesiers are little chunks of moist and super flavoursome duck and they work really well with the creamy eggs. All topped with parmesan and served with bread to soak up all the eggy gooeyness, this made a terrific quick supper for me. So get yourself some super fresh organic eggs and make a delicious and satisfying meal with them and just a few extra ingredients. Heat your oven to 180F/200C. Then prepare your additional ingredient. 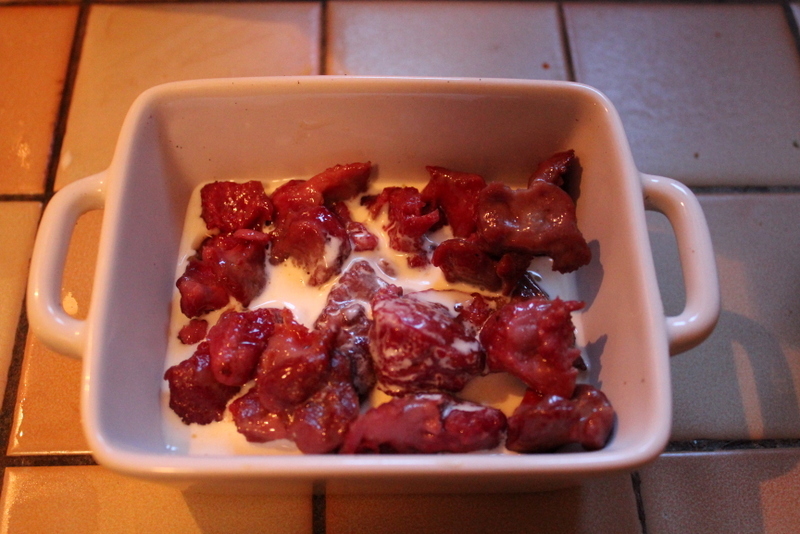 In this case, I gently fried my gesiers for 6 minutes until cooked and tender. If you are using bits of bacon, cook them now. Place your gesiers into the base of two ramekins or similar small oven proof dishes. Then drizzle over 4 tablespoons of cream into each pot. 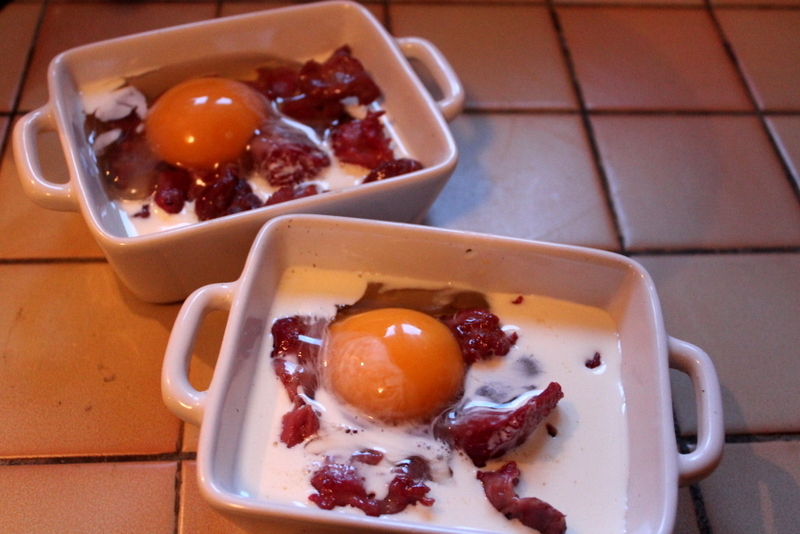 Crack a nice big fresh egg into each pot and then drizzle 1 tablespoon of cream over the top of each. Cover the eggs with grated Parmesan and sprinkle with Maldon sea salt and be generous with the black pepper. Place in an oven dish and pour in boiling water to fill to half way up the sides of the dish and bake in the oven for 15 minutes. 14 Comments on "Gascon Oeufs en Cocotte – #Flavourofspring"
Our friend just gave us two dozen fresh eggs and this is a great idea of how to use some. I’ll substitute some parma ham for the gesiers. Excellent!! I hope you enjoy it! Oh, this might be nice for an Easter breakfast (but might be too late for this year!) I’ve never heard of the duck gizzards, but I might substitute ham instead! I’m too lazy to do them for breakfast – but they would be great for a starter (fewer gesiers) Looks delicious! Oh doesn’t this look such a treat. Though I have to admit to never actually being that partial to gesiers, so a little good ham for me please. The perfect lazy brunch.